I am Stephania Zabala. I am finalizing an Erasmus Mundus joint European Master of Science (MSc) Course in Geo-information Science and Earth Observation for Environmental Modelling and Management (GEM). 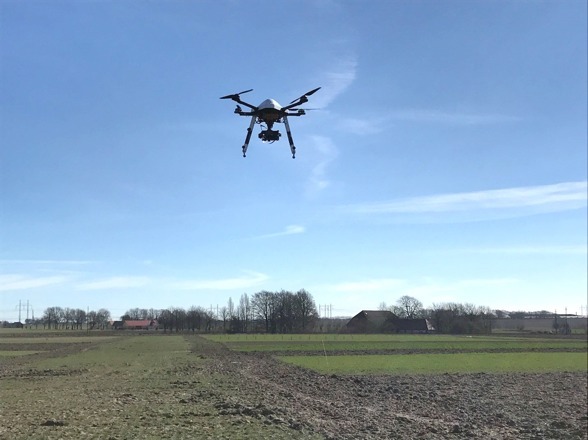 At the moment, I am working in my MSc thesis that it is about comparing Unmanned Aerial Vehicle (UAV) and Sentinel-2A satellite imagery for crop type mapping at the plot level. 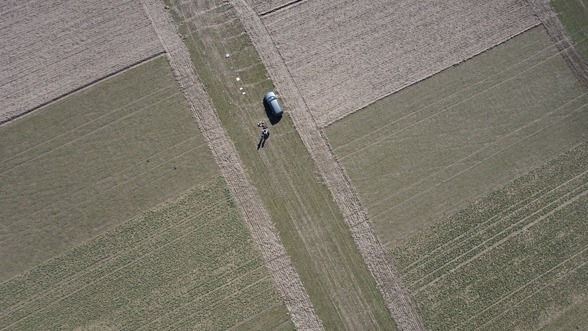 For this we have been flying over the experimental plots, located in Lönnstorp station, to collect imagery with a quadcopter carrying three cameras. The advantage of Lönnstorp station is that it has strong ground truth data, which is of high value for my research. My supervisor is David E. Tenenbaum and I work in collaboration with Per-Ola Olsson and Ximena Tagle from Lund University, and Ryan Davidson and Erik Rasmusson from SITES. 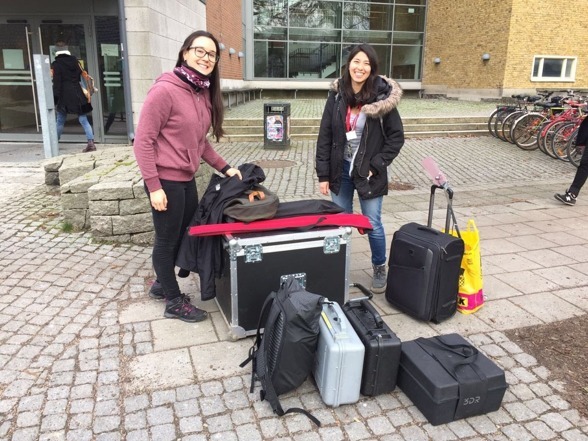 Stephania (left) and Ximena (right) with all the equipment, ready to go to the field. Photo by Miguel Castro. I am using MicaSense RedEdge multispectral camera and I am working with raw images with digital numbers (DN) and radiometrically calibrated images with reflectances values to examine their relationship with atmospherically corrected Sentinel-2A imagery. Both sensors have very well corresponding central wavelengths, although MicaSense RedEdge bandwidths are narrower than those of Sentinel-2A. In addition, I am investigating how well vegetation indices derived from both sensors, such as NDVI, EVI and GCC, correlate. The idea is to find out the degree to which UAV imagery can complement or replace satellite imagery when this is unavailable due to cloud-cover or it is insufficient for specific applications like phenology. Sweden is a cloud-prone landscape so combining data from different sensors is a way to overcome this limitation, but first we must validate the data before making detailed analysis. I am also exploring an annual time-series of Sentinel-2A NDVI data to assess its potential to capture the seasonal variation of the crops in Lönnstorp. All of this in the context of providing data and information for Precision Agriculture practices for food security policies. UAV flying over fields and reflectance panels on March 13th 2017. Image taken from the Sony camera on-board of the UAV. How should these sensors be used further on? Both UAVs and Sentinel-2A sensors are very promising. Improvements in spatial and temporal resolutions, together with a good combination of spectral bands provide the opportunity to monitor crops closely and in detail. However, for some applications the usefulness of UAVs is hindered by their relative low area coverage per flight, yet we expect that UAV data could be very useful for up-scaling measurements on a larger scale, if we consider with care the dissimilarities that may arise due to factor such as differences in image timing, differences in the sensitivity of the sensors, varying atmospheric conditions and others. I find remote sensing technologies very fascinating as they provide endless possibilities to tackle worldwide environmental problems and more! I am particularly interested in agriculture, in ways to maximize crop production and land use efficiency, while minimizing environmental impacts related to food production. Before, data availability was an issue, now we have freely available data covering the whole planet, plus long historical records that allow us to detect changes and plan our future accordingly. I say - hands-on! Experimental plots in Lönnstorp. Image taken from the Sony camera on-board of the UAV. Explorian in action. Photo by Stephania Zabala. Thanks for this insight Stephania and SITES wish you good luck with the MSc thesis!